It almost looks like I'm starting a new feature doesn't it?? But if you know me, you know that lunzy does not = crafty. ever. I don't like crafts. I'm not artistic. I'm not patient. Not a great combination when you are discussing "crafting". I like to get down and dirty and get it over with. But every so often I like to indulge my kids. who, of course, love doing art projects and anything crafty. It's at these moments in my life that I really wish we lived near my mom, the Queen of Crafts. Last week was GAWGEOUS and we were outside almost everyday. loved, loved, loved it. It finally felt like Spring was right around the corner. We saw Robins all over the place. The snow has finally melted from Snowpocalypse and we have grass. new, young, fresh, green grass! and wild onions. and crocuses and the start of tulips and daffodils. and lots of chirping birds. and buds on the trees. you get the picture. I'm excited. and we are OUTSIDE. So I'm feelin' it. I can actually see my raised garden bed again. Sass is able to dig for her beloved wormies -- we told her they've been sleeping all winter in the frozen ground. The Mini-Lords of the Flies are out in full force. Life is good. We're all smiles with rosy, sun-kissed cheeks. But then we were hit with a Flood Watch over the weekend. of course. We decided to make the most of it and since MamaBear can't hide in the closet with Tequila when BigDaddy is out of town, we did crafty things. But useful crafty things. We started seeds for our garden. Hopefully, as one never knows the outcome of projects when an almost 6 y.o. and 3 y.o. are involved. It was really painfully easy. 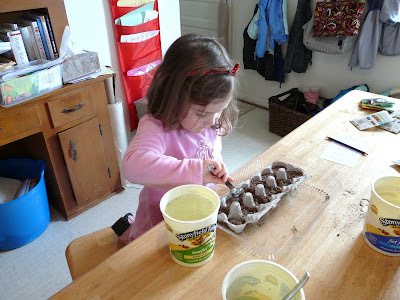 I saved some cardboard egg cartons in my Munchkins' use-for-whatever-you-want box (cardboard tubes, paper towel rolls, plastic trays, scrape pieces of things) and I found this great idea for using toilet paper rolls to make starter seed eco-pots. We ran to the store for Starter Seed Mix (5 bucks) and the Munchkins and I picked out what we wanted to plant. Sassy wanted sunflowers and other pretty plants (more flowers), BigBoy picked radishes, carrots and watermelons (what he planted last year) and I chose some herbs and flowers. We also still had some seeds left over from last year. Are they still good? who knows. This was all about the act of DOING. Get them excited about gardening again. Becoming part of the Nature process. At the store, a very sweet Mennonite woman informed me that it was waaaay to early for watermelons. Thanks, but I just want them excited about picking out seeds. Plus there are always a gazillion more seeds than we ever need, so we can do more later. yah, there were SEVEN watermelon seeds. But at a buck a pack, is it that big of a deal if they don't turn out? So we have our soil, our containers, a plastic tray to set them in, some water and our seeds. I also put the soil and water in large yogurt containers and had the kids use spoons. Make the activity last longer and was easier for them to handle. I made a chart of what we were planting where, but BigBoy and I got our mixed up and I double seeded some by mistake. The kids keep walking over to the seeds to check them out. Are they growing yet??? uh, no, we just planted them 5 minutes ago.... But I like that they will be able to scope seeds out up close and personal. They can look at them whenever they want and see every little detail in the seedlings, once we have some. I'm praying some of the plants make it until we can plant them in the garden/flower beds. I really, really pulling for the watermelons. Something about proving a "real gardener" wrong. fairy gardens This would be super fun and a great way to incorporate fairy stories into the garden. so cute! Garden structures I would love to do this THIS year. I think the kids would LOVE it, but I'm not handy. sigh. The Great Sunflower Project- I found out about this last year, after the fact, of course. but had it on my mental to-do list ever since. We found the right variety, Lemon Queen right at good ol' WallyWorld. I'm there for you on the structures - they are SO easy to make. You could get fancy & use a drill or just keep wrapping with twine, whateva. I have a greenhouse that has desperately needed cleaning out. I just got the parts to fix it (one large window blew out in a storm a year ago) and I haven't started my seeds yet... *sigh*... I want to be just like you. I'll have to go get some seeds. (and last year's seeds should be fine if you stored them in basement. Outside storage can get iffy. So there - not lurking, actually commenting... even if it is self indulgent. Did you find Belle yet? I like to buy little plants instead of seeds as you see results sooner. Seeds take sooooooooo long. Makes me anxious for summer! Watermelons by the way would never grow here...not enough heat. Love the little picture of her planting here!